When we recently toured Golconda Fort I observed a diversity of species amid the immensity of the fort. Some individual species were very abundant. There was a robust yellow-bodied dragonfly that was swarming; I didn’t get a chance to for a close-up picture or identification, but they were quite abundant (you might be able to see one or two flying in the picture below). Yet, at the same time, there were lots of other butterflies, beetles, flowering plants, and more. Earlier in the semester, my friend and fellow ecologist Dr. Ranjit Daniels (read a short blurb about him), of Care Earth Trust, discussed the idea of monuments being used as a way to preserve biodiversity. Can historic monuments such as Golconda Fort and the Taj Mahal be sites that have the added benefit of preserving biodiversity? What is the species richness of various taxa at monument sites? Has that ever been investigated? Even in National Parks, such as Kasu Brahmananda Reddy (KBR) Park, right in downtown Hyderabad, a 400-acre park, the extent of biodiversity is unknown. 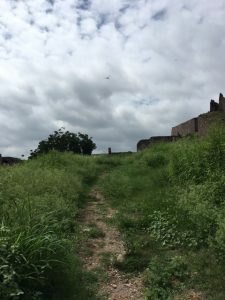 Some who care about the park like it that way – they would prefer that no one knows what is actually in there, as they feel that knowledge will be exploited for encroachment or exploitation. Certainly, primary productivity is often high at these sites, although the level of landscaping varies. So ecosystem services are there, including provisioning services (providing clean water), supporting services (soil formation and nutrient cycling), and here especially cultural services (providing spiritual and religious benefits). 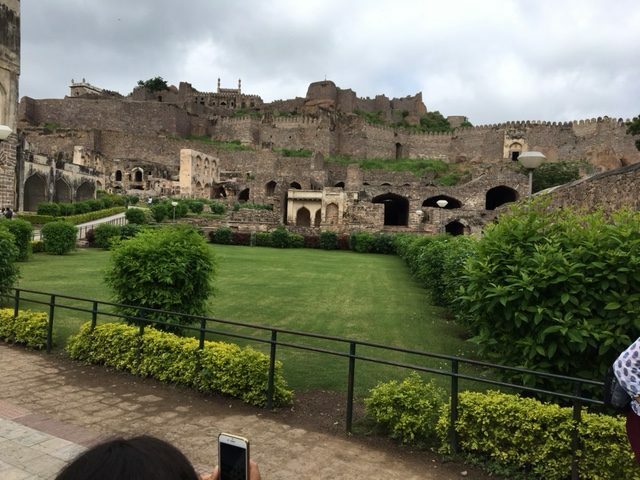 The Taj is heavily landscaped, but Golconda Fort, not being a World Heritage Site subject to their rules and regulations, was much less manicured. But trees are there, as is diversity of vegetation, as can be seen below. 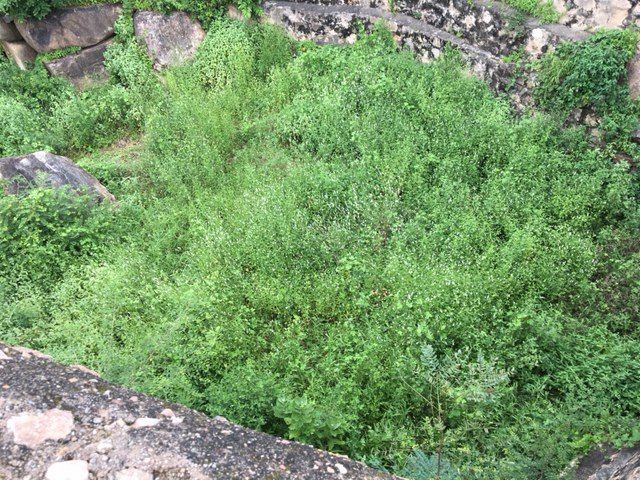 Looking down into one of the water tanks at Golconda Fort, filled with vegetation. 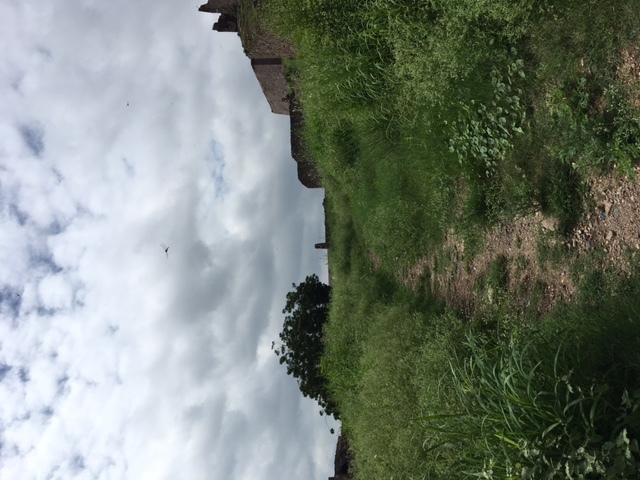 A more manicured section of the Golconda Fort site. 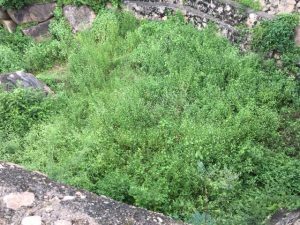 One of the interesting features of Golconda Fort is the presence of three large holding tanks, each at a different elevation. One can be seen above, although that picture is of the highest one, currently not holding water (but lots of vegetation growth). The lower two contained water, and were very eutrophic with probably large mosquito populations, as can be seen in the image below showing the second tank. Again, note the vegetation. Interestingly, there is a series of clay pipes that were used to pipe the water up from the first to the second, and the second to the third. Persian wheels were used to pump the water. 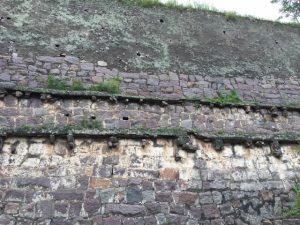 You can see where the clay pipes were situated along one of the walls of the fort in the picture below. 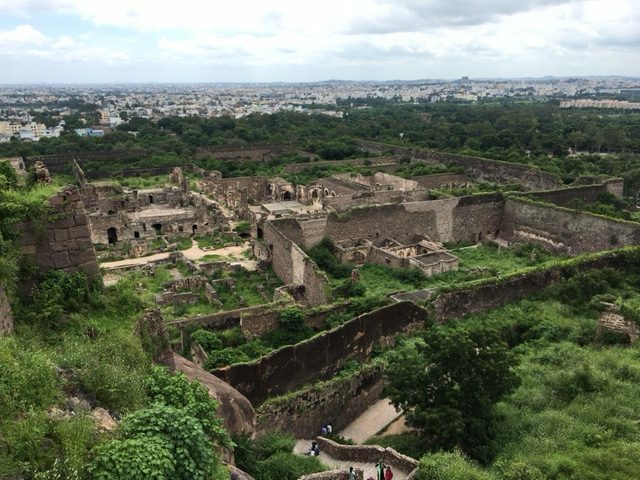 Finally, a view of the fort from high up reveals a large amount of vegetation, as well as the city of Hyderabad off in the distance. 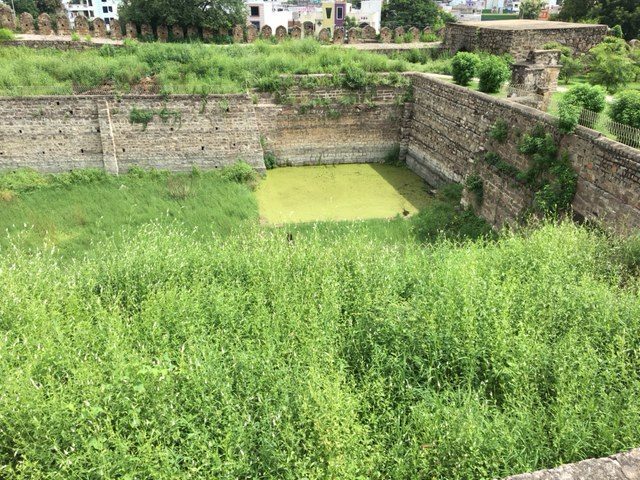 In ruins and monuments such as these, much biodiversity can be found and saved. Fort wall showing where the clay pipes were that transported water from lower to higher tanks. Previous Post: « Religion in India: a visual beauty, but an environmental burden.